When life gives me lemons… I make cupcakes!!! 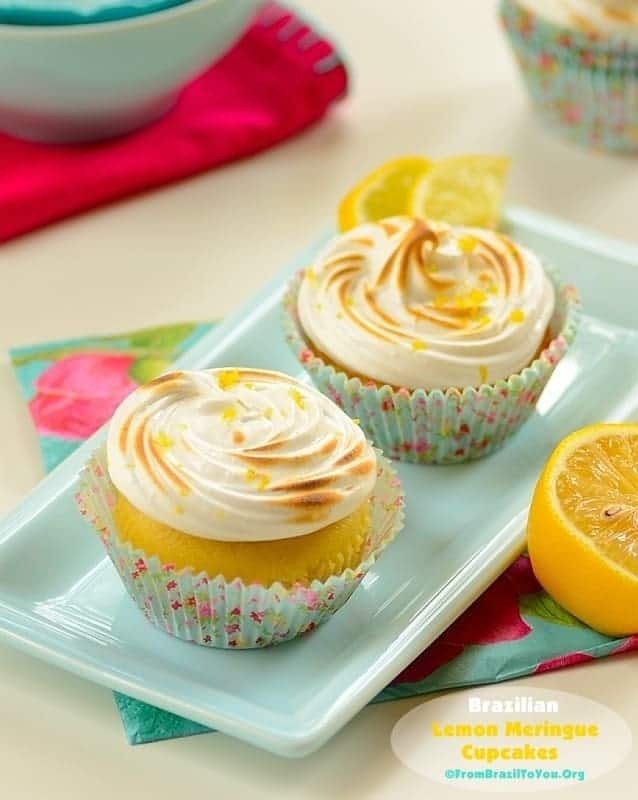 🙂 Yes, precisely: Brazilian-Style Lemon Meringue Cupcakes!!! Say what? Do I hear you asking, “How are these cupcakes different from American lemon meringue cupcakes?”… Well, these Brazilian lemon meringue cupcakes are inspired by our torta de limão (or Brazilian lemon meringue pie), which consistes of a cookie crust, lemon mousse, and toasted meringue topping. So these cupcakes are filled with lemon mousse instead of lemon curd!! The lemon mousse is basically what sets the Brazilian lemon meringue cupcakes apart from the American ones. Another little detail: Although Brazilian lemon meringue pie is made from limes (which we call limão), I used in these lemon meringue cupcakes what we call in Brazil limão siciliano (or true lemon) — a real favorite of mine. But you can use either limes, regular lemons, or Meyer lemons. It’s really up to you! Besides flowers, nothing reminds me more of Spring than lemons, with their fresh, sharp flavor. I am really looking forward to its arrival. We are only a couple of days away, since the first official day of Spring in the northern hemisphere will be on March 20th. Yay!!! Another fave of mine for springtime is our Sunshiny Mango Upside Down Cake… remember that one? As you can imagine, coming from a tropical country, I am sick and tired of long winter days. 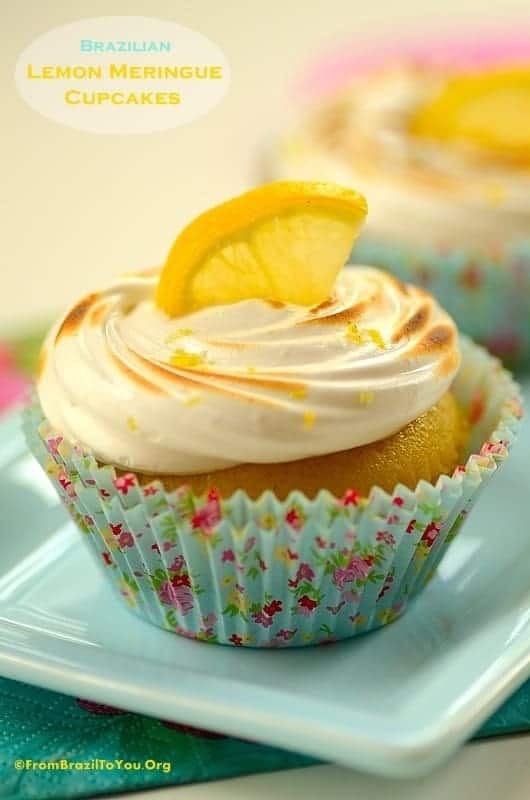 To joyfully welcome Spring, I have prepared for us these sweet and tangy, scrumptious lemon meringue cupcakes — which are easy to prepare and real crowd-pleasers. I do hope you enjoy them as much as my family and I did!!! 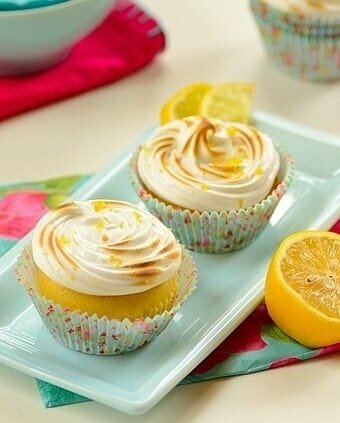 Sweet and tangy lemon cupcakes filled with lemon mousse and topped with toasted meringue frosting. To make the lemon cupcake batter, preheat oven to 350 degrees F (178 degrees C). Line a cupcake tin and reserve. In a medium-sized bowl, stir in together the dry ingredients: flour, baking soda, baking powder, and salt. Set aside. In a small bowl, combine whole milk and both lemon juice and zest. Set aside. In a large mixing bowl with paddle attachment, beat softened butter for about 1 minute on medium speed. Then add the sugar, beating at low speed until light and fluffy (about 3 minutes). Add eggs, one at a time, to the sugar mixture, beating well on low speed after each addition. Alternately, add the dry ingredients or flour mixture and also the reserved mixture of milk and lemon juice and zest to the egg mixture, beating well after each addition. Using an ice cream scoop, fill cupcake liners 3/4 full with the batter. Bake for 15 minutes or until cupcakes are puffy and bounce back when lightly touched. Let cool completely on a rack before filling with lemon mousse and meringue frosting. To make the lemon mousse, whisk all the 3 ingredients together until obtaining a homogeneous mixture. Fill cupcakes with lemon mousse by first cutting out a small plug in the center of each cupcake using a paring knife. The plug should be to about one half of the vertical depth of the cupcake. Reserve the cupcake plug. Pipe lemon mousse into each hole. Close the hole with the reserved plug -- this will require trimming off most of the bottom part of the plug so that when replaced in the hole the plug will be level with the rest of the top of the cupcake, and will not squeeze out the mousse. Place filled cupcakes in the refrigerator. To prepare the toasted meringue frosting: Place egg whites, sugar, and cream of tartar in the heatproof bowl of an electric mixer. Then, set the bowl over a saucepan containing simmering water. Whisk constantly for about 3-4 minutes or until sugar has dissolved and whites are warm to the touch. Transfer bowl to electric mixer fitted with the whisk attachment. Beat mixture on low speed and then gradually increase to high until obtaining stiff, glossy peaks (about 5 minutes). Add a few drops of fresh lemon juice, mixing until combined. Using a large star tip or other tip of your preference, pipe meringue onto the cupcakes. Toast meringue with a blow torch and sprinkle lemon zest on top of the toasted meringue. Decorate as desired, serve, and enjoy! These lemon meringue cupcakes are filled with lemon mousse and topped with toasted meringue frosting. 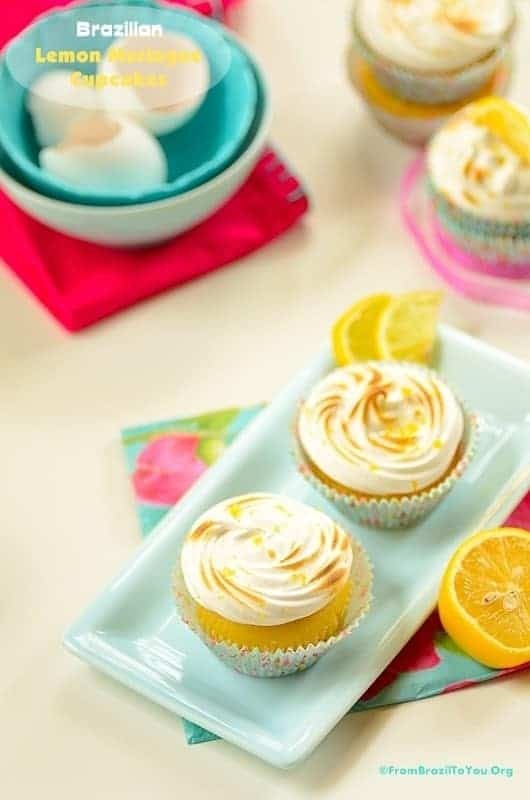 Lemon and Meringue both are my favorites… These cupcakes look gorgeous !! Love them!! The weather in Texas is crazy. One day looks like Spring has already arrived. The following day seems that winter has returned again and insists on staying. I am looking forward to Spring even though has not officially started in the US. Oh wow, these look so scrumptious. Lemon yum! Thanks a lot, Norma! And welcome to FBTY!!! Oh Denise both my favorite! I can imagine how delicious this would have been 🙂 Love it! Rekha, dear! Thanks a lot!! These are for me Denise. Seriously! Lemon mousse in a cupcake topped with meringue..the thought itself gets me excited. They look very pretty and the colour is just perfect. I love sweets with a lemony touch. This is just my kind of dessert! 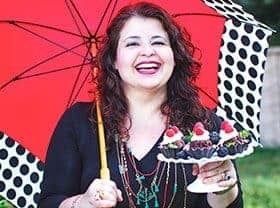 Denise – the texture on these cupcakes is phenomenal – they look so so moist and simply decadent! The Lemon mousse filling is an incredible idea – and the meringue topping is gorgeous! Thank you, Shashi! I am happy that you have enjoyed every single component of these treats! Thanks, Amira! They are lemony yet mild. As I read your post and drool at your gorgeous sunshiny cupcakes, I am rudely awakened by the swirls of blowing snow outside my window! I think spring would be nice now! As would one of those lemon cupcakes, I adore lemon cakes and these look so happy! Thanks, Nazneen! I have been looking forward to Spring!!! I see…Thanks so much, Francesca!!! You are welcoming Spring, and we are saying good bye to Summer…not a tragedy if I do it with one of your cupcakes…!!! 🙂 …I wish I could send them by mail to you!!! Denise, my family would be thrilled to usher in spring with your gorgeous lemon meringue cupcakes!!! LOVE these! I’m enthralled with your version of Lemon Meringue Cupcakes as lemon desserts are a personal favorite! Your opening photo is just magnificent! I want to grab the lush cupcake off my computer screen! 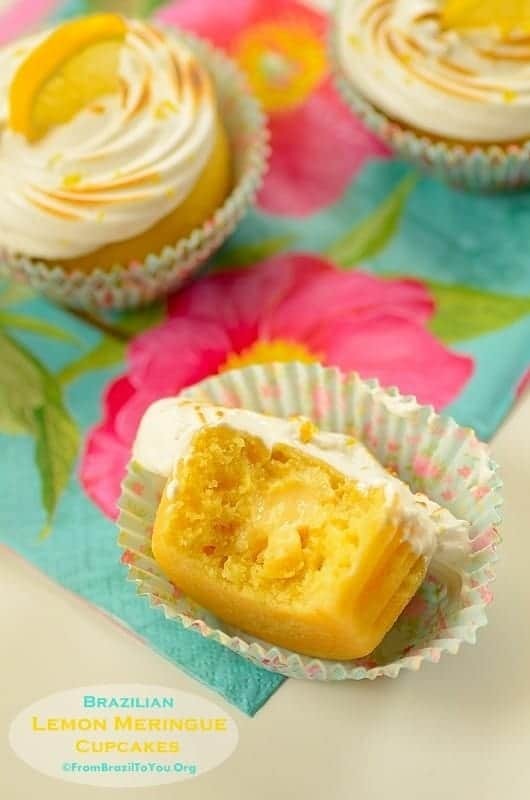 I love lemon meringue pie so I know I would be crazy about your Brazilian lemon cupcakes. They look absolutely delicious. Oh these look wonderful Denise. I’ve had lemon on the brain lately too, it is such a spring-thing! I love the idea of meringue instead of icing, such a nice change. Thanks, Chris! Nothing reminds me Spring more than lemons — and flowers as well. Lemon merengue is a favorite here.